Introducing from StarCamp the Quick N Easy 265 Drive-Away Awning. This is a delightful extension for the side of your motorhome or campervan, providing excellent storage and living space. Suiting vehicles with an awning connection height between 180cm and 210cm and complete with adjustable webbing straps on the tunnel (cowl) for a secure attachment Ideal for VW Transporter Campervans and vans sized alike! 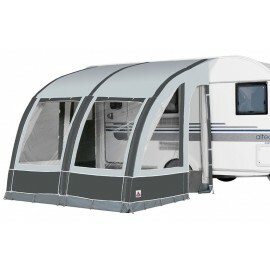 The Quick 'n' Easy lives up to its name as it features dual piping (beading), complete with 4mm beading for attaching the awning to a Fiamma or Thule Omnistor winch/wind-out canopy awning, and 6mm beading for attaching the awning directly onto your awning channel no need to purchase a Driveaway Fixing Kit! 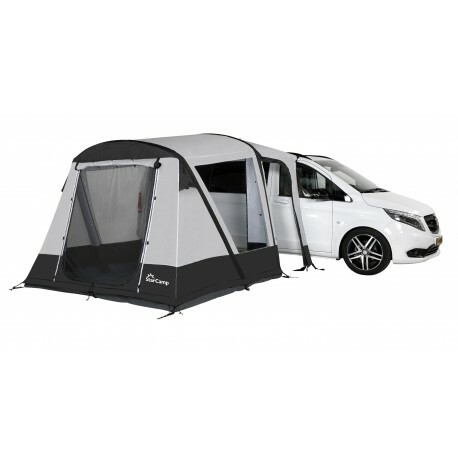 The awning features a width of 265cm along with a depth of 240cm providing usable space for storing, dining, lounging or sleeping, should you be using an inflatable freestanding inner tent within the living space. Inside the Quick 'n' Easy 265, you are welcomed to a sewn-groundsheet providing weather and damp protection, making your outdoor stay that much more comfortable. Clear view windows allow you to enjoy unspoiled views, and where there is a window there is blind providing privacy at night. 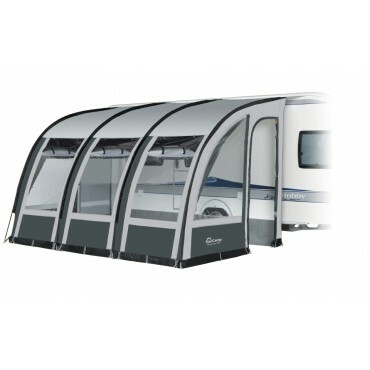 The zipped front window panel provides entry into the awning and can be rolled up providing easier access, improved air flow on those warmer days and allowing in more light. In addition, the front panel features a mesh fly screen, allowing natural airflow while keeping those pesky insects at bay. The driveaway tunnel measures a depth of 110cm and is a great place to store bikes and camping equipment that you wish to store out of sight. With an access door on either side of the tunnel provides ease of access to your drive-away vehicle. The air frame delivers quick and effortless pitching and a high-volume manual pump is supplied. The canvas is flame retardant and made from a coated 150-Denier polyester material offering excellent protection against the rain. Offers the optimal strength to weight ratio, perfect for those who require a manageable awning that benefits a convenient pack size and pack weight, suiting touring and active campers. This is a lightweight touring awning and, as such, is designed for this use. It is not designed, intended or warranted for use in bad weather or seasonal / extended use.